Right after U.S. forces went into Afghanistan in 2001 — in those heady “Paris 1944” days of liberating Kabul and most of the country — one of my best friends put to me an urgent request. Knowing I was en route to Kabul he asked me to please bring him a “Karzai hat” upon my returning to the States. My friend was referring to the haberdashery of the newly installed Afghan leader, Hamid Karzai, whose fashion attire – robes, hat and more – was the first impression many Americans and others fixed upon the new Afghan leader. The hat and wardrobe conveyed a style that seized the imagination of many and added to the vibes that seemed to suggest the United States was in a good fight and was going to make a positive difference. Even the merchants of Kabul bought into it. When I first asked around for such a hat, there was none for purchase. Two days later, the same merchants were waving me into their stores and quickly the phase “Karzai hat” went like a tsunami through the streets. “Karzai hats” – like that unexpected love affair between Afghans and their new American friends — were sprouting everywhere. The merchants knew a good thing as well. Everything was beautiful. Americans were happy to go after the bad guys hiding in Afghanistan and be a friend of the good people. Afghans were truly happy Americans were helping them throw off some evil oppression and, in the process, settle a few scores. America showed the world it had learned from the mistakes made by the Soviets – who after all invaded Afghanistan, not liberated it. This was going to be different. The people there liked us. Indeed they did. Afghans were genuinely grateful for how U.S. action gave them another chance to breathe. Then things just slipped away, much like Osama bin Laden did at Tora Bora. The U.S. idea of democracy and what should happen in Afghanistan, as noble as it was, was not quite the Afghan’s cup of tea (and this is in a nation where a lot of tea is served). The U.S. military effort seemed mismanaged and without direction. The nation-building plan was as poor, thin and brittle as the attempt to build a ring road around the country. Only Karzai’s hat still looks good 11 years later, although the colors seem less crisp. He remains president over a government that is weak and lacking popular support, except from those who use it for their own personal enrichment. Today’s blowback in the wake of the burning of the Korans was just a matter of time. In fact, the violence associated with the burning merely made public what has been brewing for years, as the Afghan people shifted from being wildly pro-American to becoming confused and upset to putting U.S. and NATO troops close to the same category where they hold the Russians. It does not matter that the Koran and other Islamic texts that were removed had extremist inscriptions written in them. Burning them was foolish and gave an opening – and a vivid reason — to those who oppose the Western efforts to justify violence and improve their own personal political motives. They were waiting for the chance. 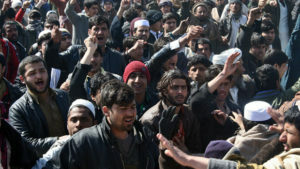 The media has reported the singing of “Taliban songs” during demonstrations. The New York Times wrote that Afghanistan is “a religious country fed up with foreigners.” Well, Afghans never did like foreigners but this is far beyond that: as the Los Angeles Times reported, there is now “a visceral distaste for Western behavior and values” among significant numbers of Afghans. Nation building is tough. Especially when your side has kill teams allegedly hunting Afghan civilians for sport and posing with dead bodies, or when there are videotapes of your side urinating on dead Afghans or abusing children or wearing Nazi SS markings, all well documented in the media. Makes it easier to stir up Afghans to turn their weapons on good, well-meaning soldiers who train, work and patrol with them. Since 2007 there have been at least 47 such attacks, which is historically unprecedented. Not in Iraq, not in Vietnam, not in Korea or even in the Philippines did anything similar occur. It was always going to be a hard sell. Even in those “Paris liberation” days, it was clear that only so much Western thinking would be politely permitted – and no thanks on actually doing most of what the West wanted. It was clear early on, at the dinner tables in the houses rented by Westerners. Male Afghans would graciously accept the invitation to sit and dine together, but would then refuse to sit at the same dinner table with newly appointed female members of the Afghan government who happen to be guests. So how do you pull out on terms and timetables not of your making? Does it matter? The reality: it is only delaying what will happen in two or three years. Not wanting to “lose” Afghanistan is a red herring; it was lost centuries ago. Many Americans rightly feel that the U.S.’ time in Afghanistan should have ended, or downsized, long ago. The killing of Osama bin Laden gave the perfect moment to exit. No one wants a Karzai hat any more. And no one seems interested in selling them, especially to Americans. The transactions ended long ago. Tom Squitieri has spent more than three decades as a journalist, reporting overseas for the Lowell (Mass.) Sun, the Boston Herald and USA TODAY. He won three Overseas Press Club awards and three White House Correspondents' Association awards for his reporting from Haiti, Bosnia, and Burundi. He is a newly-elected board member of the Overseas Press Club. In academics, Squitieri was invited to create and then teach a unique college course that combines journalism, public affairs, ethics, philosophy, current affairs and war zone survival skills into a practical application to broaden thinking and day-to-day success. The class "Your 15 Minutes: Navigating the Checkpoints in Life" has a waiting list each year. Born in Pittsburgh and raised in western Pennsylvania, Squitieri has been on all seven continents and in dozens of places he intends to keep secret.